The basic meaning of the word ‘slander’ is when a person makes any false statement or any wrong accusation about a person which damages that individual’s reputation or their career in the workplace. This kind of accusation made by the person is punishable legally as it is a false statement made by the individual without knowing the facts. 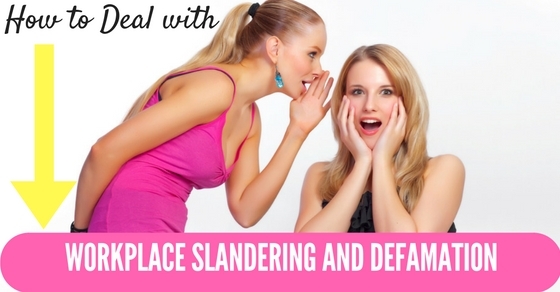 Workplace slandering happens in most of the workplaces but the individual needs to tackle them and not let it destroy their life both personally and professionally.Here mentioned few tips on how to deal with workplace slander. If the person wants to stay away from any kind of workplace slandering they can mention to the others that they want complete silence and do not want to interact with other ongoing gossip in the workplace with any other working employees. If the person acts in this way they can stay away from any kind of offensive behaviour or slandering going on in the workplace. Whatever may be going on in the workplace, whether it is any kind of false remarks or accusations about the individual himself or any other employee in the workplace known to the person, they should always stay calm in the workplace and outside so that they do not lose their mind over it and have difficulties in both their personal and professional lives. If a person wishes to stay away from any kind of ongoing gossips in the workplace it is really advisable that they avoid any kind of interactions or conversations with their fellow co-workers which are unnecessary. If they adapt to this method they will surely stay away from office gossips but they will also not have employees talking to them for a very long time and staying away from them. Office gossip is a natural thing which happens in the workplace on an every day basis and it cannot be stopped. But though it happens it is necessary that no kind of trouble is caused or any misunderstandings happen as these small gossips can turn into slandering and damaging a person’s reputation. So, individuals must not let this happen. If a person wants to know whether the conversations going on in the workplace involves slandering, then the person needs to start paying attention to what is being gossiped in the office, who is talking about it and whether that person gossiping has any kind of history when it comes to behaving this way in the past. If there is any kind of slandering going on in the work place about the person or someone else then if they want to put an end to it quickly, they should avoid the gossip at all times because that gossip itself can help in solving the problem as fast as possible. While those conversations are taking place, the individual should also let them know indirectly that any kind of slandering can get the person fired and so they can notice it and put a stop to it completely. It is always known that if the communication is effective enough in the workplace then there will be no kind of slandering about any employee or the employer as they can approach them without any fear and tell them their problems. If this does not happen then the person will go towards other unwanted measures which quickly may turn into slandering the employee or the employer. Any employee in the workplace needs to identify the negative people and the negative gossip in the workplace and stay away from it if they wish to be away from any kind of slandering about any individual. This will help them in not getting involved among the negative crowd in the workplace and carry on their life in harmony and not affecting their life negatively. Whenever a person is talking to the other employees of the workplace, they must know that never to begin any kind of conversation or gossip in a negative way and initiate the conversation. If they initiate the conversation in a negative way, they might say something which is not meant to be said which may reach the wrong ears with the blame of it entirely coming upon that individual, that can turn into slandering against an employee. This refers that a person who wishes to stay away from any kind of negative behaviour in the office shouldn’t spend any alone time with any employee in the workplace. For example, if the person wants to eat their lunch, then they should try as much as they can and stay alone and eat at their desk rather than interacting with other employees which can lead to gossips among all of them. One more way of avoiding any kind of office gossip and slandering would be to ask the boss to hand more work to the person so that the person can stay busy only concentrating the work in hand. If the boss asks the person as to why they are asking so much more work then they can respond by mentioning ongoing problems in the workplace in general but not necessarily point out anyone in particular. If there has been ongoing gossip regarding a particular individual, not knowing the entire situation or reality may lead it to be an ongoing office rumour that someone has started. So the person shouldn’t believe on this completely if they do not know the entire story and ignore it so that they aren’t affected by it in their life. If the slandering going on in the workplace is about the employee and they come to know about it, and wish to put a stop to it then they can take necessary steps so that this cannot happen again. It depends on how serious the gossiping is and how fast it is spreading. So at first knowing all the necessary facts and tackling all these problems individually is recommended to every individual. When the individual understands the situation completely they may realize that the problem is not as big as they expected it to be. The situation may be small just towards a smaller group so it is recommended that the person should forget about it and not let the situation affect the personal life or the happiness in their personal life. So it is very essential to see how big or small the situation is in the workplace. The person who is slandering or gossiping negatively in the workplace might have some kind of history with the individual. So they must realize that the person may try and harm the personal feelings of the individual and so the individual should act accordingly towards that whether to ignore it as they aren’t bothered by it or take some necessary action regarding it. If the person realizes that they do not have any kind of history with one another then they both can start up a conversation about the comments passed but in private so that they may understand how they feel about it. If it was passed up unknowingly by the person then they might understand that they have hurt the feelings of the person and may issue an apology regarding the comments passed and may also improve the relations between them for the future. Whenever a person gets involved in office gossip or gets to know some rumours regarding them then they tend to lose the positive mind that they have and they tend to become a bit more negative towards their professional life and give less interest to their job. This may even affect their personal behaviour whenever they are around their family due to stress. Before taking any kind of necessary action, it is essential that the person gathers all kind of necessary information and entire evidence before they take any further action regarding the situation going on. If the person does not wish to take it publically then they can personally write a letter to the employee. To further support the claim of the false accusations done by the person, the individual can gather a number of people who have witnessed such conversations and use them as proof present over there at the time when the conversation happened. Even at the time when the letter written to the employee is presented as proof, these people can be presented so that they can back the person up whatever the situation may be. At first if the person isn’t changing their behaviour regarding the on going situation in the workplace then for a first hand reference to solve the problem the person can refer to the manual or the employee hand book of the company or look over the contract with the company the person has. It will give the person a better understanding regarding how this situation has to be dealt with and how to tackle any kind of gossips going on in the workplace. This option should only be considered when everything is going over the limit and in doing so, the individual should calmly present the case in front of the boss and determine all the facts that needs to be considered and also let the boss know what efforts have been carried out by the individual so that the boss understands how bad the situation has become and try and solve it as fast as they can. When presenting the case in front of the boss always remember that all the evidence that the individual has collected before coming to a conclusion should be presented in front of the boss, so that the boss can get a better understanding about the situation. Know what all efforts the person has taken to solve the problem on their part, so that a solution can be presented to the individual as soon as possible. If writing a letter or talking to the person and the boss hasn’t made any difference then the person still being concerned can take a step more further and approach the management or the HR department of the firm. Let them know about the ongoing situation about the individual in the office and try and provide a solution to the problem as soon as they can, so that everything will once again start functioning in harmony. So, one must know how to deal with slander in the workplace, because, slander is considered as a very harmful and painful act towards an employee which happens causing a problem in their life both physically and mentally. If such a thing happens the person should always keep their calm so that they can try and find a solution towards the problem as quickly as they can. Approach higher officials if this situation is going out of hands. These problems are common in the workplace so the person should ensure that it isn’t affecting them which will further delay to bring in the solution. So the person should think smartly at this time and solve the problem.